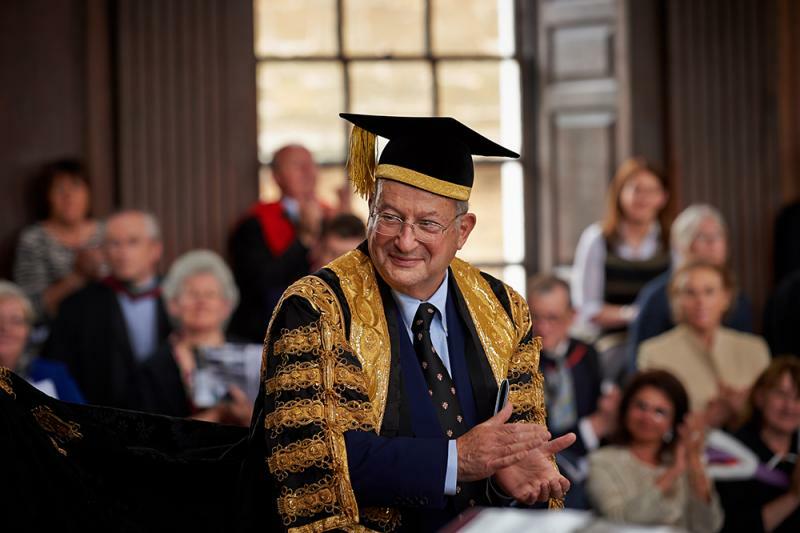 The Chancellor of the University, currently The Lord Sainsbury of Turville, usually confers honorary doctorates at a special Congregation held in June each year. When an honorary MA degree is conferred, however, the Vice-Chancellor does this at the start of an ordinary Degree Congregation. On the day of the Honorary Degree Congregation, flags fly and the bells of the University Church are rung. In the early afternoon the Chancellor’s Procession, led by the two Esquire Bedells with the University’s silver maces and including the honorary graduands and the principal University officers, makes its way from a College where the Chancellor has given a celebratory luncheon, to Senate-House Yard. At the same time another procession forms in the Yard, consisting of Heads of Colleges, professors and higher doctors of the University, the University’s Librarian, the Director of the Fitzwilliam Museum, and members of the University Council. Unless there is heavy rain, both processions walk around the Yard before entering the Senate-House, where their arrival is greeted with a fanfare of trumpets. The gowns worn by the honorary graduands and by other higher doctors present are scarlet, with silk linings and facings of different colours according to the degree concerned, apart from the MusD robe, which is cream damask with cherry-red linings and facings. Round bonnets are worn, of black velvet with gold cords and tassels, apart from the DD degree, which has a special square cap in black velvet. Recipients of an honorary MA degree at an ordinary Degree Congregation wear a black gown and the normal square cap. Honorary graduands do not wear hoods to graduate. 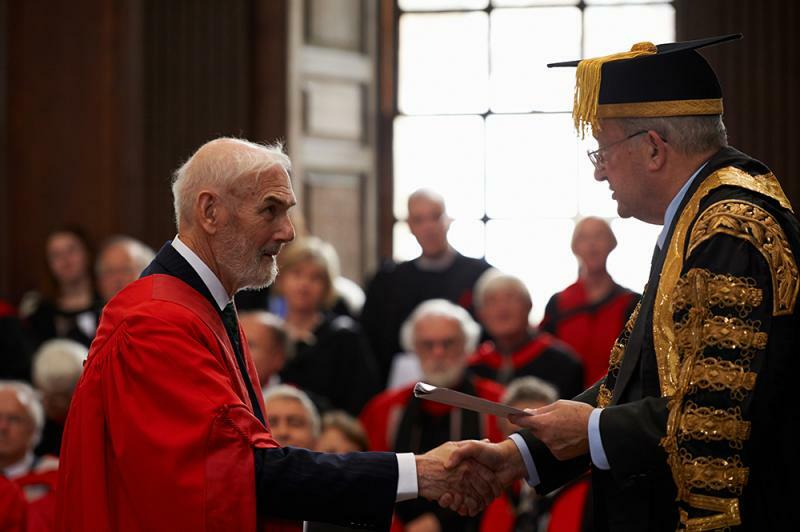 The day of the Honorary Degree Congregation in June is a 'scarlet day', when Cambridge doctors wear their scarlet 'festal' gowns instead of black ones. All matriculated members of the University, including students and alumni, wear academical dress at the ceremony, with hoods if they are graduates. The Congregation is a formal meeting of the Regent House, the governing body of the University, on whose authority all degrees, whether full or honorary, are conferred. However in addition to members of the Regent House, other members of the University community (all staff or retired staff of the University and the Colleges, students and alumni) may also apply for tickets and the University invites certain County and City dignitaries to attend. Proceedings are in Latin and start when the two Proctors, the elected officers of the Regent House, announce the business of the day, i.e. to confer honorary doctorates. Authority for the degrees has already been obtained at another Congregation several months beforehand, so there is no possibility of a challenge or vote at this stage. The Registrary, the University’s chief administrative officer who witnesses and records all formal acts of the University, then presents the Chancellor with a copy of the detailed programme for the occasion. The Vice-Chancellor sits alongside the Chancellor throughout, but plays no active part in the proceedings. After a short recital, usually by a student or students holding instrumental performance awards, each honorand is led forward in turn to stand in front of the Chancellor. Honorary degrees cannot be conferred in absence, so if the approved recipient is absent, no degree is conferred. The University’s Orator makes a speech in Latin, marking the achievements of the honorand, and at the end of each speech the recipient goes forward to the Chancellor, who stands, takes them by the right hand, and confers the degree using the prescribed formula. There is then an opportunity for applause, but no other speeches are made and the new graduate then sits to the Chancellor’s right. After all the honorary graduands have been admitted, there is a short recital by a choir, usually drawn from one or more of the Colleges, and finally the National Anthem is sung. The Bedells then lead the Chancellor and his procession, including the new honorary graduates, back into the Yard. The Chancellor retires to change from the State Robe of black damask and gold lace with a train and a gold-tasselled square cap to a scarlet doctoral gown with velvet bonnet, before returning to the Yard to host a garden-party on the lawn for all those present. 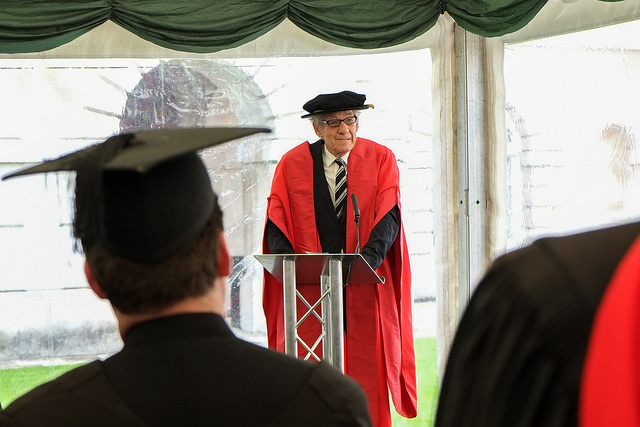 During the garden-party the Chancellor makes a brief speech and proposes a toast to the new graduates and one of them replies with another short speech and a toast to the University.